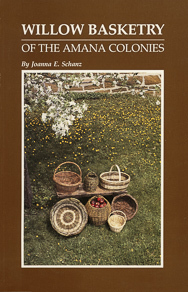 This book covers the history of basketry in the Amana Colonies in Iowa and gives directions on how to make baskets. Patterns for willow baskets by Joanna and her accomplished students are available at Schanz Broom and Basket in West Amana and Amana and at the Amana Arts Guild Museum Shop in High Amana. Joanna has studied basketry in Europe and has demonstrated her art nationally.